In post-Civil War America, ambitious munitions manufacturer Victor Barbicane (Joseph Cotten) develops a source of power strong enough to propel a rocket. He enlists the help of rival scientist Stuyvesant Nicholls (George Sanders) in building a rocket to the moon — but Nicholls believes Barbicane’s intentions are ultimately evil, and sabotages their trip. 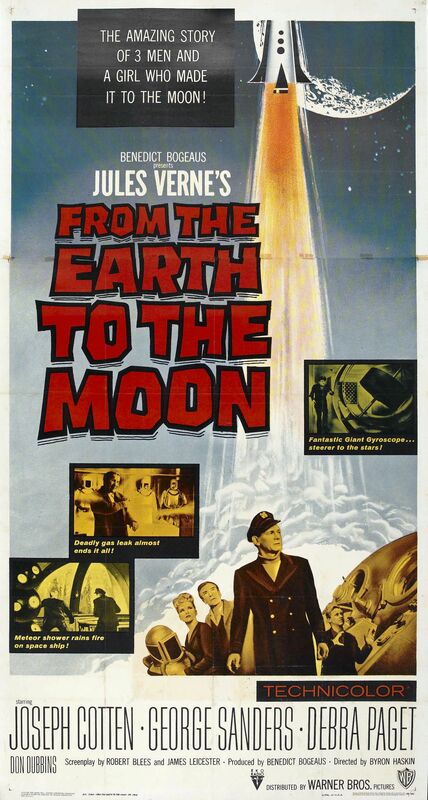 Widely acknowledged as one of the least inspired Jules Verne adaptations to come out of 1950s Hollywood, From the Earth to the Moon (directed by special effects guru Byron Haskin, though his talents are wasted) is disappointing from start to finish. Screenwriters Robert Blees and James Leicester deviate substantially from the source material: in Verne’s story, Barbicane and Nicholls are friendly academic rivals who spend most of their trip politely arguing over engineering issues; in the film, this rivalry is beefed up to catastrophic proportions simply to add drama to the narrative. (Naturally, a romance — involving an impossibly made-up Debra Paget — is included as well.) Making matters worse, the science is both sloppily handled and inconsistent: for instance, an elaborate, presumably essential centrifugal spinner is used during take-off to “counterbalance gravity”, yet stowaway Paget emerges perfectly fine from the limp space suit she’s hidden out in. Don’t bother seeking this one out. No; this one is only for die-hard Jules Verne fans — and even they will likely be disappointed.